Whoever said "Life isn't a race to see who can get the most stuff" obviously hadn't seen people falling over each other to get back into the shops on Boxing Day. The homes of most folk I know already resemble a small department store by the time Christmas is over. Surely there can't be anything left that anyone needs? Not that shopping behaviour has anything to do with need, of course. Many people shop for a whole host of psychological, emotional and social reasons, as we talk about in SHECONOMICS. If you're back in the shops next week, SHECONOMICS is coming out in just 9 DAYS. If not, there's always the lovely internet. You can get the book cheaper if you pre-order from Waterstone's. If you’d wandered past the Bank of England today and spotted a couple of Sheconomists striking a pose on the steps, it was just Simonne and I having a photo shoot for our feature in a national newspaper next month. In true Sheconomical style we were told just beforehand that, due to cutbacks, there would be no styling, hair or make-up support for us. Yikes! Simonne was a bit worried that she wasn’t wearing a jot of make up. According to the Evening Standard, Sheconomics is the Buzz Word to watch out for......and there's now fewer than 3 weeks to wait, with the book Sheconomics hitting the bookshops on January 8th. With the buzz of excitement mounting and the economy heading in the opposite direction, we expect copies of Sheconomics to fly off the shelves. So pre-order a copy on-line if you want to be sure of getting one. You get £2 off and free UK delivery if you pre-order from Waterstones. No not Christmas, that's still 15 days away as far as I know. But the long-awaited release date for Sheconomics, the book, is now less than a month away on January 8th. It's so exciting. Just as the new year brings those new bills and credit card statements, we hope it'll give women everywhere a way out of those economic doldrums. If you want to make sure of a copy, you can pre-order (with £2 off) from Waterstones now. Simonne asks....What does the change in base rate mean for you? The Bank of England has again slashed interest rates, this time by 1%, taking them down to 2% - the lowest level since 1951. It’s just like buses – you wait ages for one and then several come along at once. And it looks like they may come even down further next year. Every crisis has its victims and it’s not just poor old Pick ‘n’ Mix that had its demise this week. Duty free isn’t what it used to be either, at least in Europe. Perusing the perfumes in Amsterdam's duty free shop yesterday I clocked prices much higher than they would be, duty paid, at home. All because of the euro exchange rate, hovering at a very unfragrant 1.2 to the pound. Surely that means an end to all those cross-Channel shopping trips too? And perhaps by all spending at home we’ll be doing our bit for the economy. Who really needed all those giant Toblerones anyway? Is it me, or does anyone else find it rather ironic that the government will be borrowing extortionate sums to reduce VAT to encourage us to spend. Just as we get to grips with having to spend less and paying off our debts, we’re encouraged to spend more. Seems like we’re not learning good money-habits from the people that look after the country’s purse-strings! What do psychoanalysts and financial analysts have in common? They both get things wrong sometimes. Psychoanalysists are too obsessed with the past. Financial analyists aren’t very good at predicting the future. This week they predicted that retail sales for October would have slumped by 0.9%. They didn’t, they fell by just 0.1%. In fact they were 2.2% UP on this time last year. So we're spending on the high street like there’s no recession tomorrow. Why? Well the reasons are psychological but not in the way Freud would have said. In our survey of over 700 women, a whopping 79% said they shop to cheer themselves up. Many use spending to manage their moods. So when things are down, buying gives them a lift. Dan was single, lived at home with his father and worked in the family business. When he found out he was going to inherit a fortune when his sickly father died, he decided he needed a wife with whom to share his fortune. One evening at an investment meeting he spotted the most beautiful woman he had ever seen. Her natural beauty took his breath away. "I may look like just an ordinary man," he said to her, but in just a few years, my father will die, and I'll inherit $20 million." My conjecture about what the recessionista is up to during crunch-time wasn't far out. Today's press report a 14% rise in the sale of sewing machines. And a 40% rise in the sale of buttons! Cue last year's coat shortened, puffballed, with a funky belt and shiny new buttons. Her shares have gone down the pan and her mortgage through the roof, but the girl in the office still seems to wear something new every day. You’re looking at a fully fledged recessionista. That’s the word on everyone’s lips for the woman who spots a good deal from a mile away and manages to look a million dollars on a shoestring. While you’re holding the phone line trying to get through to the bank for a loan she’s probably deftly remodelling last year’s wardrobe item into a swish new look. Apparently the secret of the recessionista is making good use of what you’ve got and unearthing bargains. And saying ‘vintage’ not ‘second hand’. Good news for the single Sheconomist everywhere; stingy men are off the market for a while. According to survey results just released by Skipton Building Society, almost half of single men say they’ll survive the credit crunch by staying unattached. Apparently they don’t want to waste money on romancing. So while they’re staying at home counting their bits of leftover string, single girls can have fun with the guys who don’t see romance as a waste of money! Anyway, surely the most romantic things in life are free? Breaking news about the Bank of England cutting its interest rate to 3% has prompted me to blog again. That’s the lowest rate for 53 years. Reactions are mixed. Will mortgage lenders pass on the low rate to borrowers? Is it a panic move? The risk of lending has been so high of late that lenders are demanding higher rates for offering credit. If you’re on a tracker mortgage a rate cut of around 1.5% should follow through (unless there's a minimum rate clause). Fixed rate mortgages, as the name suggests won't change. Discount/Standard Variable Rate mortgages may see a 0.5 or 1% cut, but it's at the lender's discretion. Now's the time to review the rate you’re getting on savings. Because if borrowing is cheaper then savings won’t attract high interest rates. If you can get a fixed rate that's good, go for it.But only if you can afford to tie up your money for a while. They’re calling it the Obama bounce – a small surge in investor confidence that comes from having a new hand at the helm. Obama plans to invest billions in renewable energy and that's helped green stocks to soar. Bound to have a knock-on effect for the rest of the economy too. We may have all got sick of all the coverage of the US election, but at least it’s given a much-needed boost at this critical time for the economy. At last the government has woken up to that fact that very few women clock up a working life of 39 years. That’s how many qualifying years are currently needed for a full basic state pension. But taking career breaks to have children make it impossible for many women in the UK. In fact, only one-third manage it. So the Department of Work and Pensions said this week that women can buy back the missing years at a reduced rate. Over half a million women will benefit from the change if they act quickly. It won’t plug the female pension gap completely but at least it’s a step in the right direction. Did you know that it’s National Energy Saving Week this week? What better time to look at ways of saving energy (and, of course, money!). Have a play with the energy saving clock on this site to give you some inspiring ideas: http://www.energysavingtrust.org.uk/. Women, apparently, are donning their battle gear against the economic crisis. And it consists of higher than ever heels. An international shoe designer was reported saying at the weekend that heels rise in proportion to economic downturn. So if we are in recession we’ll see more 3, 4 and even 5-inch heels. Women are known to cope well in a crisis. So I predict that we’ll see, literally, the rise of the Sheconomist in coming months as more and more women handle changes in family income and bring their budgeting skills to the fore. After all, as they say, Fred Astaire was a fantastic dancer but Ginger Rogers did everything Fred did. Backwards. And in high heels. It’s a pretty turbulent time in the world of finance (keeping me busy with lots of calls from panicky clients). But don't get hypnotised by all this bad news and make decisions that are just knee-jerk reactions. Don’t forget that emotions can highjack common sense. So perhaps seek advice before making big decisions. And try to avoid the mistake that can often be made when fear strikes - of selling stocks and shares at the bottom of the market or closing down accounts and stuffing money under the mattress. If you want to know where’s a safe place to put your savings, have a read of the following article: http://www.fool.co.uk/news/your-money/savings/2008/10/09/big-banks-for-safe-savings.aspx?source=uemfoleml0010038. Or for a view on what to do with your investments: http://www.h-l.co.uk/news/Feature-articles/articles/795/rq/article. It's quite scary isn't it? All this credit-crunch crisis and talk about cutting back. Where do we start, I'm sure many women will ask themselves, particularly those who fear their face will fall off if they stop using expensive beauty products. They could try my friend V's experiment. Worried about eye-wrinkles V decided she had reached that eye-cream stage of life. The adviser in her local store recommended one for £95. So V persuaded the girl to part with a sample size for free. Then she applied the cream religiously every night. To her left eye. Two weeks later V and hubbie are having dinner. V asks: Does one of my eyes look brighter, more youthful and less wrinkled than the other? Hubbie: Yes, now you come to mention it, it does. Against a backdrop of the country’s recession-depression I pondered the impact of having to cut back on spending today. After visiting an exquisite (free) exhibition of ceramics at the Korean Cultural Centre and wandering into the wonderful (free) Photographers Gallery (where Hans Aarsman’s Photography Against Consumerism includes ‘Desired things photographed – not bought’) my optimism was reinforced by the sight of a young oriental man with a huge smile outside the National Gallery. He held aloft a placard offering ‘Free Hugs’. Priceless. The human condition sometimes seems characterized by a cycle of endless repetition. We are endowed – but also trapped by – a brain that wants to compel us to keep doing the same things. The smoker who can’t give up, the gambler who’s drawn to the betting shop and the shopaholic who’s convinced just one more purchase is the route to happiness. We truly are habit machines if we give in to our compulsions. It’s hard to tell the brain to stop doing something. But it is easy to tell it to do something else. That’s why the Do Something Different approach is at the heart of Sheconomics – and the book is full of ways to Do Something Different with money. It simply makes being good with money a bit of a no-brainer. As holidays approach so does the season of silly money. I’ve just picked up a pile of Japanese yen for my Tokyo trip and, quite frankly, it could have come with a pile of community chest cards and a tiny iron for how real it looks to me. No wonder that we all suffer from the money illusion when we visit foreign countries with a purse full of play money. Even when we know the conversion rate, the money illusion fools us about what the money is worth. According to research we spend less when the foreign unit of currency is less than our own (e.g. £1 = 0.89 Oman Rials). But we spend more when the foreign unit is more than our own (e.g £1 = 1.25 Euros). So with £1 = 220 yen, I guess that means I’m in for a blowout. Do not collect £200, do not pass Go, do pass on all those gorgeous Japanese designs ….mmm, we’ll see. However much I try, I cannot get my heart to sink when I hear the phrase ‘credit-crunch’. Even ‘income squeeze’ doesn’t grip me with fear. And recession, I think, has a nice ring to it. If it means we can say bye-bye to bling, say up-the-Joneses instead of keeping up with them, and reject rampant consumerism, surely that’s a good thing? Then we can find creative ways of cutting things like our utility bills. Edna Everage halved her electricity bill just by turning off her husband’s life support machine. Perhaps I’ll try low-energy light bulbs. Ever felt like a mug when you’re still redirecting mail for the previous occupant of your flat years after they moved out? While the junk mail deserves the bin, there’s some correspondence that’s important. Several years ago I forwarded windfall shares to a previous occupant of my flat. They’d moved out five years earlier. I only knew the importance of the envelope because I’d received similar post from the same company. And a client of mine recently discovered they had £5,000 of windfall shares that they hadn’t known about, which nicely paid for a new kitchen. Think back to the last couple of times you moved. Did you send out change of addresses to all of the companies? Can’t even find paperwork on the account or plan? All’s not lost. Even if you’ve only got a vague recollection of a pension you once held with a previous employer or an investment plan or savings account that’s long been forgotten. http://www.mylostaccount.org.uk/ which guides you through the process of tracing savings accounts you’ve lost track of. And http://www.thepensionservice.gov.uk/atoz/atozdetailed/pensiontracing.asp for lost pensions. Or, if you’re time poor, you can pay £18 to get a search done for you of any lost life policies, pensions, savings or investments by visiting: http://www.uar.co.uk/. Annoying, inefficient, expensive…… my reactions to absent-mindedness. Of which I’ve had a few moments lately (going upstairs and wondering what I went up for, waving my wet hands under the tampon machine in the ladies, forgetting to post a blog, you know the kind of thing). I was reassured that the considerably-younger-than-me brilliant wit and comedian Sue Perkins admitted she’d had a direct debit going out of her account for insurance on a home she hasn’t lived in for six years. “I should have informed them when I moved” she says, adding with surprise, “apparently there’s no clairvoyance with banking which is annoying”. Hugely annoying, Sue, we're with you on that one. Note to self to check all direct debits on bank statements. Maybe that’s what I went upstairs for. The miracle that is compound interest never ceases to amaze me. An improbably named financial planner Malcolm Cuthbert is quoted in today’s Times as saying that if 35 year olds put the £1.80 a day they spent on a daily cup of coffee into their pension pots instead, at age 65 they’d get £3,843 more every year for the rest of their lives. Wow! Worth suffering chronic caffeine withdrawal for I’d say. Simonne's hot tip for budgeting on the go! Hey, I’ve just discovered a nifty little budgeting tool that you can download onto your mobile phone. You keep track of day-to-day spending by recording it on your phone. It lets you set your own spending limit on things like food & drink, clothes or entertainment. Then you compare actual spending against the limit you set. Much easier than scrambling around for a notebook when you’ve spent £3.40 on a sandwich! You choose how you want your spending reported - daily, weekly or monthly. It’s free to download (just the cost of connecting to the internet for a short while) but your phone needs to be WAP enabled. You can download the ‘spendometer’ by visiting Credit Action’s website: http://www.creditaction.org.uk/spendometer.html or by opening your phone's web browser and going to: http://www.spendometer.co.uk/spendometer2.jad or http://www.spendometer.co.uk/spendometer2.jar. It will then try to download and install automatically. You can now have fun staying in control of your spending! With the credit crunch continuing to bite, banks and building societies are becoming increasingly selective about who they’ll lend to. So, if you’re planning to borrow any money or apply for new credit in the near future, make sure you get hold of a copy of your credit report. You can then see if there are any mistakes on your record and you can use the information to help you hunt out the best deals from lenders that are likely to accept you. Use a comparison website like Money Supermarket (http://www.moneysupermarket.com/) to compare loans and credit cards without leaving a ‘footprint’ on your record. And try Experian (http://www.creditexpert.co.uk/) for a free credit report provided you sign up for monthly membership which you can cancel within 30 days. It's been pretty hectic on planet Sheconomics lately. The book Sheconomics is motoring along and we've been getting onto its pages everything women have told us about their relationship with money. That's no mean feat. Or should I say no mean feet given the shoe-habits some have divulged. o You’re incredibly sorted in all areas of your life but somehow, along the way – you forgot to get a pension/make investments/provide for your financial future. How much money do you reckon the average Brit needs to sleep well at night, feeling safe in the knowledge that they’re financially secure, without any money worries? Well, Kaupthing Edge (the Icelandic bank who made a debut in the UK savings market a couple of months ago – yes, I know, strange name!) has done some research on this very question. They believe that £92,507 would do it. In fact, for men the figure came out as £101,999, while women apparently don’t need quite so much to feel secure - £82,193 would do it for us. Financial security means different things to different people. So, my question to you is how much money do you need stashed away to give you financial peace of mind? And, if you’ve got a partner ask them this question too. You might learn something about each other. For a mere £46 a week you can hire a Jimmy Choo Rock. That’s a top-of-the-range designer handbag, now rentable by those who really feel that’s what’s missing in their lives. For a tenth of that - £4.60 – I filled my straw basket with vegetables from the local farmer’s market yesterday and came home feeling rich. Mmm…leak, broccoli and watercress soup…because I’m worth it. There’s a psychological condition called Generalised Anxiety Disorder (GAD). It’s really just pathological worrying about absolutely everything. From whether a tsunami could hit Bournemouth to whether the fridge light really does go off when you close the door. Psychologies May edition has a feature, for which I was consulted, all about money worry. Or Money Anxiety Disorder (MAD) as it may come to be known. There's a lot of it about. More than two-thirds of women in our Sheconomics survey had worried about money in the last 7 days. Antidotes to worry? Control (seizing it) and action (taking it). Although there are lots of emotions (fear, guilt, shame, embarrassment) that stand between a person’s worry and the solutions. We devote lots of pages of Sheconomics to curing this MADness! Pinkonomics – they’re after our daughters! Well done Eleanor Bailey for alerting us all to the Tyranny of Pink in Saturday’s Guardian. Marketing people have decided the road to a girl’s pocket is paved with pink. So as soon as your daughter is old enough to express a consumer preference, she’s wooed into believing that the only colour she wants to wear, sleep in, play with and cuddle is pink. The subliminal message here is there is ‘only one way to be feminine’, and it’s by surrounding yourself with all things puke – I mean puce. How can we encourage uniqueness and incite individuality when faced with such a dearth of choice? We’ve no idea what the cover of Sheconomics is going to look like when it comes out next January. But Simonne and I have been researching the female-orientated book market. And guess what? Yes, you’d think the world of publishing had been taken over by Barbie. They’re all pink. We know Headline will wave its fairy wand and come up with a fab cover for Sheconomics. Let’s just hope they spare us our blushes. What do spending and eating have in common? Well, people get fat when they put more in than they take out (calories). And people get into debt when they take more out than they put in (salaries!). Get the equation right and we've solved the obesity crisis and the credit crunch in one fell swoop. Except that the consumption of both calories and goods isn’t under the strict control of a sensible, rational fund (or bun) manager! There are all kinds of emotions that can hijack the balancing act and throw everything into chaos. That’s the bit with which Sheconomics is concerned. ...why is it that the money pages of weekend papers are often hidden in the business section? If you’re not that interested in businesses, you may easily chuck out that section and with it something that could be useful. The money pages of quality newspapers often have best-buy lists - with the best mortgage and savings deals – and articles that can help you become more financially astute and take better responsibility for your money. How about setting yourself a challenge to read the money pages next time you buy the weekend papers? You never know, you may even enjoy it! A client of Simonne's was keen to invest in a stocks and shares ISA before 6 April but didn’t want to be pressurised into making the investment choice by then. (She’s got some other money to invest and will be getting investment advice later on in the year but she’s not ready just yet). Simonne told her how she could get around this by investing the £7,000 in a Maxi stocks and shares ISA with a discount broker like Hargreaves Lansdown (http://www.h-l.co.uk/our_services/isa.hl) and temporarily holding the funds in cash. They let you do this while you choose a fund for your ISA. If you then get advice about which fund to choose you can switch funds with them or transfer, free of charge, to another ISA provider of your choice. It’s a bit cheeky if you intend to transfer elsewhere but it’s a good way of holding open £7,000 in an ISA wrapper which you would otherwise lose if you don’t invest by 5 April. Simonne has a slightly scary fact to share.....! Today is “debt freedom day” (according to independent financial adviser website Unbiased.co.uk). This means that it has taken the average Brit up to this point in the calendar (70 days) to earn enough to simply service the interest payments on their personal loan and credit card debt. And that’s without reducing it. What’s even more scary is that it’s 39 days later than last year when debt freedom day was 1 February (31 days). This is a quick and shocking reminder of how long it takes to start actually paying off debt. Women's achievements are today being celebrated all around the world. That’s no bad thing, especially if it inspires other women to aim high. Sheconomics is about helping women achieve their true financial potential. Earning what they are worth, and standing up to the persistent pressure-to-purchase, is what we believe will help women reach their goals. We’re delighted that plans for a free national money guidance service were recently published. Otto Thoresen, the head of financial services at Aegon, published his final report yesterday setting out the blueprint for a service to help consumers develop the knowledge and confidence to make better decisions about money issues. His view is that good money sense needs to be as much part of people's lives in the twenty-first century as healthy eating and keeping fit. He said a free, national service would help people to budget, save and borrow, plan for retirement and understand the technical jargon used by the financial services industry. It’s great that finally consumers will have professional impartial support through the financial maze without the fear of being sold a product, and it won’t just be available to those who can afford to pay for it. February for me is the month that I have to renew my car, breakdown and home insurances. I spend a bit of time on the internet searching out the best deals and then buy it through www.greasypalm.co.uk - a shopping portal that gives me cashback simply because it directed me to the insurer’s website. It doesn’t cost any more and I usually make £80 to £100 cash back on top of saving up to £300 by not sticking with my existing insurers. That’s enough to pay for a nice weekend break. And my premiums seem to get cheaper each year, as I get even better at finding the best deals. Just think about that weekend away when you next decide to save time and hassle by just automatically renewing your insurances with your existing provider. Are you one of those women doing more than their fair share of unpaid overtime? According to a recent TUC report nearly 5million British workers regularly put in unpaid overtime, especially teachers, lawyers, business people and media workers. And almost 40% of single women in their 30s work unpaid extra hours, compared with 26% of men of the same age. It’s said that if women want to get on at work they need to put in longer hours than anyone else. But the more women do this, the longer it will continue to be an expectation of them. If you haven’t done our ‘Are You an Under-Earner?’ quiz yet, it’s on the www.sheconomics.com home page. It was set up as a social enterprise by millionaire entrepreneur Mick Jackson. Every single penny of profit goes towards food and schooling programmes in Africa. When Mick saved a sherpa's life in Nepal he realised compassionate action gave him real positive feedback that he'd never been able to get from business alone. So he set up Wild Hearts in Action with lots of volunteers. As he said, everyone needs stationery. So why not buy your printer cartridges and your paper from them and make a real difference at the same time! They are dedicated to the highest professional standards and they say that orders are delivered very promptly. Clearly, Bagonomics is a subject I couldn’t even get a GCSE in. 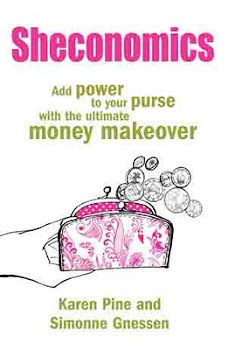 In my last blog I voiced serious misgivings about the investment value of handbags. Then Lisa Armstrong writes in the Times mag on Saturday about the huge profits to be made by playing the e-bay bag market. There’s a danger though, as she points out, that while trying to make money on your bag you spot an even more desirable recherché 2.55 Reissue Chanel that (apparently) any self-respecting bag lady just has to have. And at the click of a mouse you’ve bid away your profit and a bit more. I always thought anorak-behaviour was just for the boys, but it seems that e-Bay has thrown up some serious female bag-spotters. I heard a fashionista on Woman’s Hour this week proudly declaring that she ‘invests’ in a designer handbag each season. It’s depressing to think there are intelligent women out there who really believe that when they are pensioned off as batty old ladies they’ll be saying to themselves (or to the cat), ‘Well, Tiddles, isn’t it lucky I have my stash of old handbags to fall back on?’. Just to be safe, in case the bottom drops out of the handbag market or there’s a world clutch-bag crash, maybe alternate each season with an ISA? ‘Jobs for the Girls: Two Years on’ is a report on the government’s attempts to address the disparity between men’s and women’s salaries. The pay gap for full-time workers is still a deplorable 18%. Whilst waiting for the government to get their act together women can work on getting the “I deserve it” message across to employers. It all starts with knowing your inner worthiness and portraying that in all your interactions with others. “We need to talk about pensions”. If you haven’t uttered those words to your employer/partner/financial adviser lately then you’re probably not alone. Apparently 4.5 million women aren’t saving enough to have a half-decent retirement. If you’re one of those it’s probably a good idea to start a ‘We need to talk about pensions’ conversation sometime soon. Then, having got that out of the way and feeling all smug, treat yourself to the book that I nicked the title from (We need to talk about Kevin) for the simple reason that it’s a fantastic read! Talking of mediocrity here’s something that lots of women in our Sheconomics survey have experienced. Having been seduced by some irresistible object of desire in the shops, on getting it home they've found that in fact it’s merely mediocre. Who hasn’t done that? One in three women told us they regretted a purchase, and almost a quarter admitted to buying something they would never wear or use, IN THE LAST SEVEN DAYS. Relegate it to some recess in the wardrobe and bring on the guilt and shame, again for a third of the women. One tip from Sheconomics is to have the item put by for a later date. Then if it was an emotional (or hormonal) purchase you might find the urge to own it was just a passing phase, and your money's still your own. Never underestimate the dangers of mediocrity, particularly when it’s disguised as something great. A friend sent me Seth Godin’s ‘Curiosity’ talk today where he accuses TV of hoodwinking us into thinking that mediocre things are great. Having eschewed TV four years ago, I could only nod smugly when he said, “The thing the smartest and richest people in the world have done is switched off the television”. I wonder how long it has to be switched off for before you get smart and rich though…..
Do you have a dusty jar of coins sitting in the cupboard? One of my friends hates carrying around weighty change – anything smaller than 50p goes straight in her jar. For years she let one jar fill up, then another, and another. What stopped her from cashing in her growing collection? The hassle of sorting out mountains of coins into those little bags and carrying them to the bank. Little did she know her jars were hiding almost £125. Technology came to the rescue in the form of an automatic coin sorter in the foyer of her local supermarket. It’s ridiculously quick and easy – you tip the coins into the machine’s hungry mouth and watch the counter whizz up. And who can help but play the ‘guess the final amount’ game while you’re waiting. When the machine has finished counting, out pops a voucher that you redeem for cash at the till – or you have the option of paying your money to charity. Like making withdrawals from those ‘expensive’ cashpoints, be aware of the cost of the service – in this case 7.5 per cent of the value of your spare change. But that might not be such a big price to pay if it means the difference between paying off only the minimum on your credit card this month, and actually paying off a chunk of your post-Christmas debt. Hold your nose next time you go shopping! Psychologists have found that appetite-stimulating smells (that's chocolate, of course) induce people to seek short-term gains on unrelated purchases. In a Singapore-based study, chocolate-scented candles led to female participants being more likely to make an unplanned purchase of a new sweater, even though they were told they were on a tight budget. For most people they’ll just be a distant memory by now. The alcohol abstainers will be too drunk to remember they were going to give it up. And the resolved non-smokers will have had at least one crisis that called for a ciggie. A friend of Simonne’s came up with a novel concept – instead of resolutions (which hint too much at unresolved past problems) she suggests evolutions. This means concentrating on behaviours that allow her to evolve. Simonne says, with regards to money this might mean setting up a direct debit into a savings account each month, learning about different approaches to managing money or simply checking bank statements online regularly. She feels this approach will lead to more behavioural flexibility, help her develop and won't put a limit on what it's possible to achieve. “I owed almost £25,000 on credit cards and my financial advisor warned me that I could lose my home if I did not stop spending”. So says Catherine Hardy in a 2 page article in today’s Telegraph magazine. And the financial advisor who came to the rescue? Simonne, of course, co-founder of Sheconomics. Simonne got Catherine to do the unthinkable – buy toiletries and cleaning stuff from the pound shop, ditch insurance policies, cut her food bill from £500 to £350 a month, replace expensive debt with a bank loan and become a compulsive bargain hunter. Never buy another diet book! This weekend, and for all next week, the Independent, are giving away a part of The No Diet Diet. It’s the diet based on FIT science and the Do Something Different approach and has nothing whatsoever to do with food. So, if you’re not out buying a sofa that you don’t need to pay for until 2028, it’s worth picking up a copy every day until Jan 10th. They’re also offering a reader discount of 25% off the on-line programme (www.nodietdietway.com). Debt used to be a dirty word but attitudes to it have certainly shifted over the years. ‘Being in debt during my childhood was a bit like catching the clap’ says Janet Street-Porter in today’s Independent. She contrasts her early years, when debt was something to be avoided, to today’s world where the government expects students to saddle themselves with massive debt and then to spend a decade of their lives paying it off. I don’t have a penchant for revisiting the past but there’s a lot to be said for a return to the debt-avoidance mindset of yesteryear. I do like the man who observed that his new year's resolutions always seem to involve getting physically smaller and mentally bigger. But I thought I'd quote Mary Kenny here, since hers is to do with money. She says, "This year I am going to develop a more positive attitude to money. Each morning I will say to myself, 'I should have more money because I deserve it.' I was educated at a convent school where money was regarded as filthy lucre. Many of us are taught to expect little in the way of reward, when we shouldn't. That is why that L'Oreal advert is so popular, the one that says 'You're worth it'"
Hope your new year brings all the rewards you deserve (but, as Mary says, that does involve believing you're worth it! ).